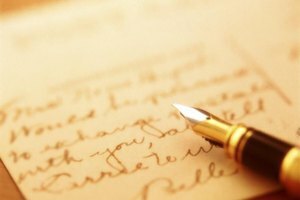 If you want to add a personal touch to a letter, sympathy note or birthday card, nothing beats writing it by hand. The problem is, if your writing isn't neat and easily decipherable, you won't get your message across. 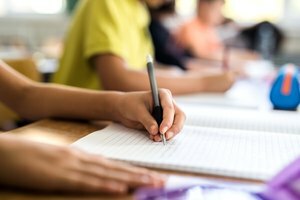 Whatever your age, it's not too late to develop cleaner, more controlled handwriting. As you work on printing more neatly, be prepared to unlearn some bad habits you may have picked up as a kid. Sitting at a desk with your hands poised over a keyboard can leave you with tight muscles in your shoulders, arms and hands. For this reason, the National Adult Literacy Agency suggests loosening up those muscles before you switch into handwriting mode. Make tight fists then extending your fingers outward as much as possible to loosen up your hands. After repeating this several times, leave your fingers in the extended position. From there, touch each finger one at a time to your thumb. Slowly circle your hands five times clockwise then repeat counterclockwise to loosen your wrists. Slowly roll your shoulders backward five times, then roll them forward five times. Gently tilt your head side to side to finish the warm-up. Get a feel for what muscles you should be using when you write. 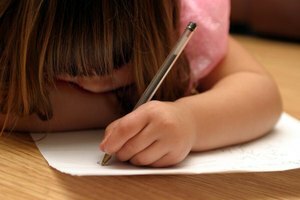 Holding your writing arm in front of you with the elbow slightly bent, write the alphabet in the air. According to Dyas A. Lawson at PaperPenalia, use your arm and shoulder to form the letters while keeping your forearm, wrist and fingers stationary. If you're doing it properly, you'll feel the muscles of your shoulder, arm, chest and back working. As you become more adept, gradually reduce the size of your air letters, then try writing this way on a vertical surface such as a white board. Make sure your shoulder -- not your hand -- powers the movement of the marker across the board. 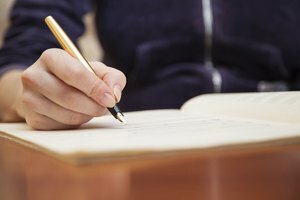 From there, try arm-and-shoulder writing with a pen on paper. Practice writing "X"s, "O"s, backslashes and spirals -- remembering the movement is from your shoulder, not your wrist and fingers. Develop a smooth, easy rhythm and aim to make your shapes uniform. Work with a writing tool that feels comfortable. Experiment to find a pencil or pen that works for you. Your coworker might swear by fountain pens while you have better luck with a ballpoint, rollerball or felt-tip. Your writing tool should be comfortable to grip and the ink should flow smoothly without much downward pressure from your hand. If you have to grip hard or press down, your hands are likely to tire and your letters will look cramped. 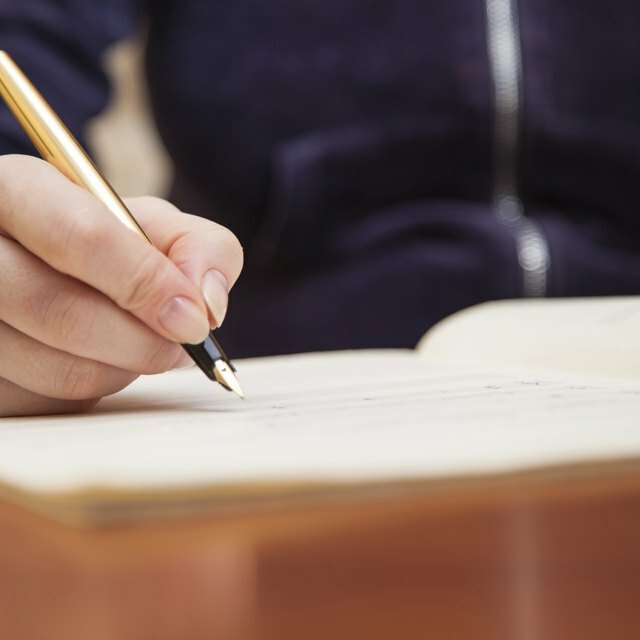 Once you have the right pen or pencil in hand, clear a space for your writing and sit up straight. You need room and the ability to move your arm freely; if you're bent over your desk or your desk is covered with junk, you'll have a hard time moving your arm and shoulder. 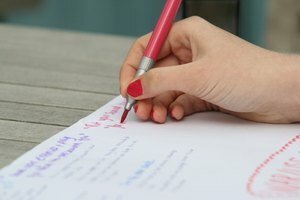 Work with lined paper to start; once your handwriting improves, you'll have an easier time keeping it neat without the help of lines. Practice writing pangrams, or sentences that contain every letter of the alphabet. Your focus should be on forming letters uniform in size, relatively smooth and evenly spaced. If you find yourself rushing, slow down. Clean, proper letter formation takes time and patience so make sure you don't feel pressured. As you write, check that your pen feels balanced and controlled. If you're not already doing so, try holding it between your thumb and index finger with the barrel resting easily on the middle finger. Looking at your printed sentences, try to identify specific problems. You might find certain letters give you more problems than others. If so, work on fixing those letters or letter combinations one at a time. Write and rewrite the problematic letters, drilling until you're happy with the results. Fisk, Judy. "How to Print Neatly for Adults." Synonym, https://classroom.synonym.com/how-to-print-neatly-for-adults-12084313.html. 29 September 2017.